Homemade Sweet Cherry Torte tastes like summer but can be made all year round. 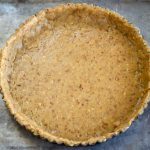 The delicious pecan torte shell tastes like a cookie and is filled with a thick sweet cherry filling. It’s an easy no-fuss recipe that tastes pretty special but perfect for any occasion. When you have sweet cherries you may crave a sweet cherry pie. Why not mix things up and make this homemade cherry torte? When I was a youngster I spent as much time with my grandmother as I could. She was a hardworking woman that could make something out of nothing and nothing ever went to waste. She had two cherry trees in her yard. We would hang foil pie plates in the trees to keep the birds out. Sometimes it worked but the brave ones still got through. As soon as those cherries were ripe we were picking them as fast as we could. I’ve been craving those beloved cherries but fresh cherries aren’t an option this time of year. My options included using frozen or canned cherries. For the sake of research, I made two! 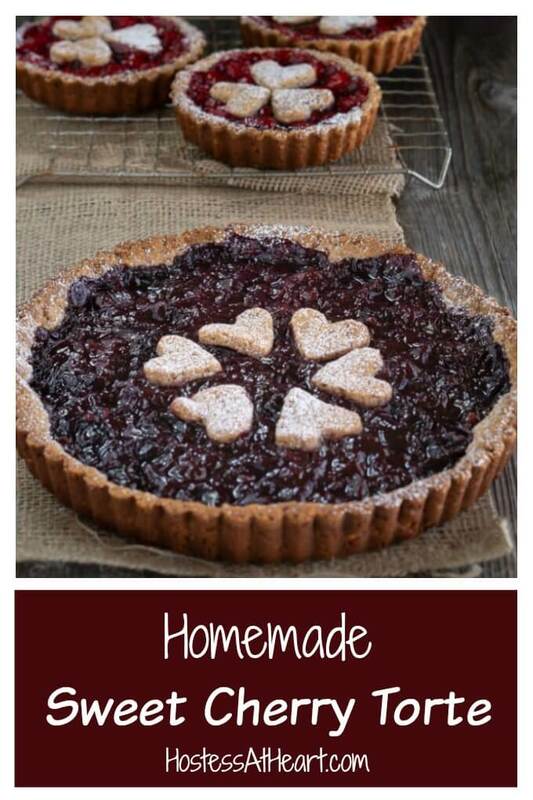 One with a homemade cherry filling using frozen cherries and a mini torte using canned cherry pie filling. 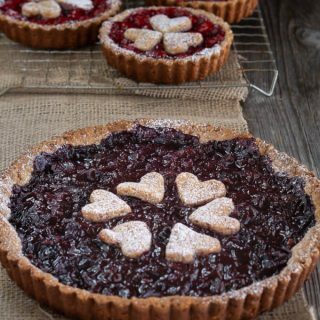 John’s grandmother was a sweet Italian woman and I was lucky enough to get her Raspberry Linzer Torte recipe. I’ve made it several times. We love this easy Italian dessert. I decided to try that recipe with cherries and a pecan shell instead of the almond torte shell. 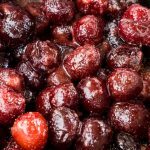 The canned pie filling cherries are prettier and you can’t beat the convenience. However, the consensus was that the filling made from the frozen cherries was the winner. It doesn’t add much time to the whole thing. 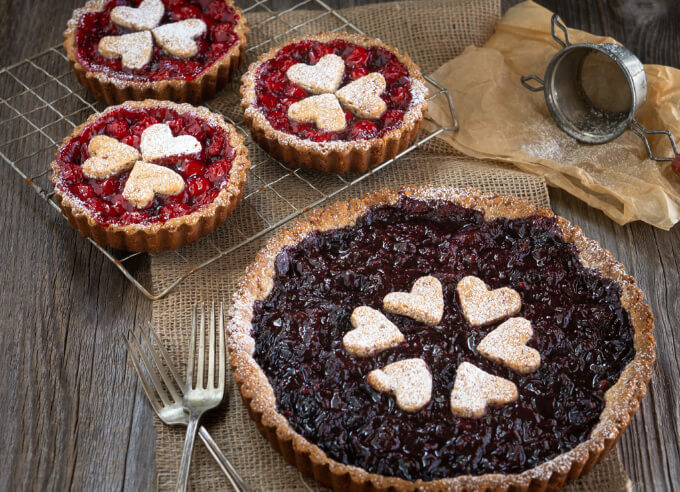 What is the difference between a Torte and a Tart? TORTE comes from the Italian word torta and is usually multiple layers of cake filled with cream or fruit. 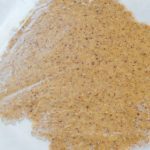 It can also be made with a very small amount of flour and use ground nuts or breadcrumbs. TART is very different from a torte. A tart usually uses a pastry base with an open top. They can be called tart, quiche, flan or pie without much overlap. So by definition what I’ve always called a tart is actually a TORTE! 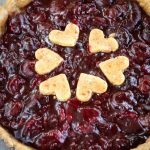 If you love this Cherry Torte recipe be sure to leave me a comment and a 5-star rating and don’t forget to pin it to your favorite board! 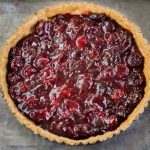 Homemade Sweet Cherry Torte starts with a shell that tastes like a cookie and then is filled with a thick sweet cherry filling. In a saucepan, combine the cherries, sugar, salt, lemon juice, zest, and butter. Cook over medium-low heat until berries soften and start to break down (7 minutes). Stir in flour and cook until thickened (about 2 minutes). Remove from heat and set aside. Preheat oven to 325°F. Lightly grease tart pan or a round cake pan. Take a little more than half of the dough and press it into an 8 or 9-inch tart pan, round cake pan, or mini tart pans. Press the remaining dough between two pieces of waxed paper or plastic wrap. 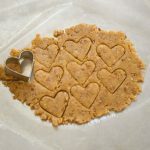 Roll flat and stamp out hearts using a cookie cutter. 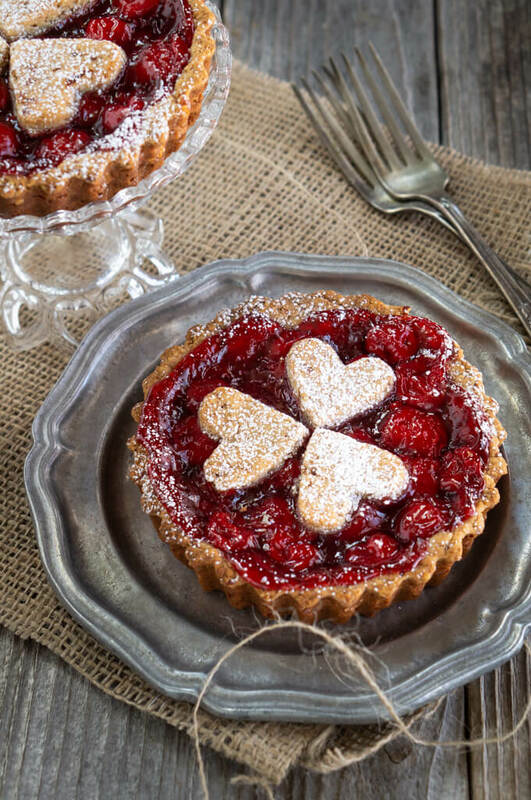 Place the hearts around the center of the torte. Allow the torte to cool on a baking rack then remove the pan. Sift additional powdered sugar over the top if desired. I just love these tortes and love sharing them with my sweet father-in-law soon to be 95. I hope your feeling ok Loretta. Reducing sugar is always a good idea and one that I struggle with. I do love using honey though but don’t use the artificial stuff. I’d love to hear how your experimenting goes! Oh! A Cherry Torte! These look so delicious. Hah! You know I love those stretchy pants when I’m baking! Thanks, Jennifer! This is beautiful! We have a cherry tree, and I’d love to make this with our cherries. And serve it with a big scoop of fresh whipped cream! Oh man, I sure wish I still had a cherry tree! I hope you enjoy it as much as we did! Well, I have tart cherries in my freezer from this past summer but I’m sure my grocer sells sweet. I like the heart decorations – perfect for a Valentine treat. Thank you Judi! I think your cherries would work just fine. Before you thicken them give them a taste test and add a little more sugar if you think they need it.